The classic shaker door brings you a touch of the elegance of yesteryear. There is so much choice when it comes to the top with either a stone, solid surface, engineered veneer or ceramic. This blend of options will bring traditional elegance to the most regal bathroom. Add a tallboy, mirror or shaving cabinet to complete the look. 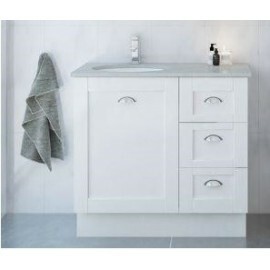 Timberline Heritage Vanities Please click on images to view our full range.